Here at Collide, we travel with a purpose. Earlier this season, we were looking for an impromptu weekend vacation that wouldn’t be a hassle to plan and would give us plenty to do. On our checklist was delicious local fare, awesome music, and laid back adventures. The historic city of Portland, Maine checked off all those boxes. (Fun fact: the Other Portland was actually named after the original Northeast locale.) We caught The Shins on their recent Heartworms tour at a cool outdoor venue. We took in picturesque views, sampled the killer craft beer scene, visited local record stores, and even island hopped. Here are the highlights from our recent trip to the seaside destination. To maximize our weekend, we caught a red eye into Portland Maine Jetport (PWM). The small airport is ten minutes from downtown. We skipped a rental car (parking is expensive) and stayed in the city proper. Wherever we went our friendly Uber drivers provided us with history lessons and local tips. The Press Hotel in downtown is where it’s at. 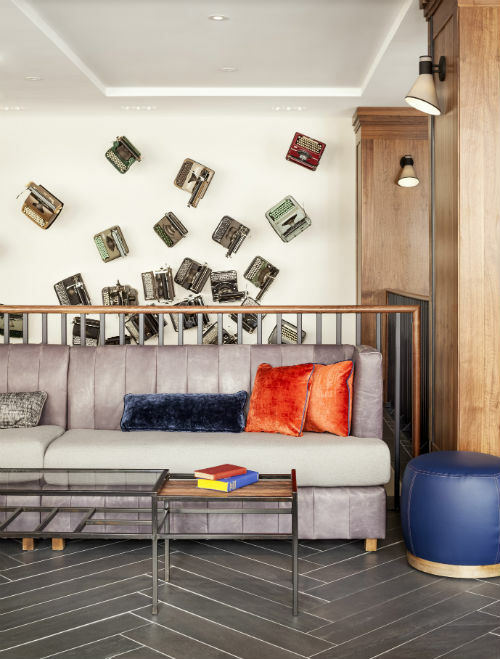 We wanted the ease of a trusted name (It belongs to Autograph Collection, part of Marriott) and the personality of a boutique hotel. The building once housed the Portland Press Herald and the newspaper theme can be felt throughout (the mini art gallery has a cool typewriter installation adorning the wall). Perks include airport shuttle service and drop offs within a 3-mile radius, umbrellas for rainy day sightseeing, and bicycles. Make a reservation to dine onsite at Union Restaurant for a bounty of locally sourced, beautifully plated, mouthwatering fare (your Instagram will thank you). Our room wasn’t yet ready so we caught the hotel shuttle to The Front Room, located in Munjoy Hill, a hip neighborhood just east of downtown with beautiful views of Casco Bay. It was our first time having bacon lardons (they’re basically delicious bacon cubes) and homemade molasses bread. We were seriously stuffed. 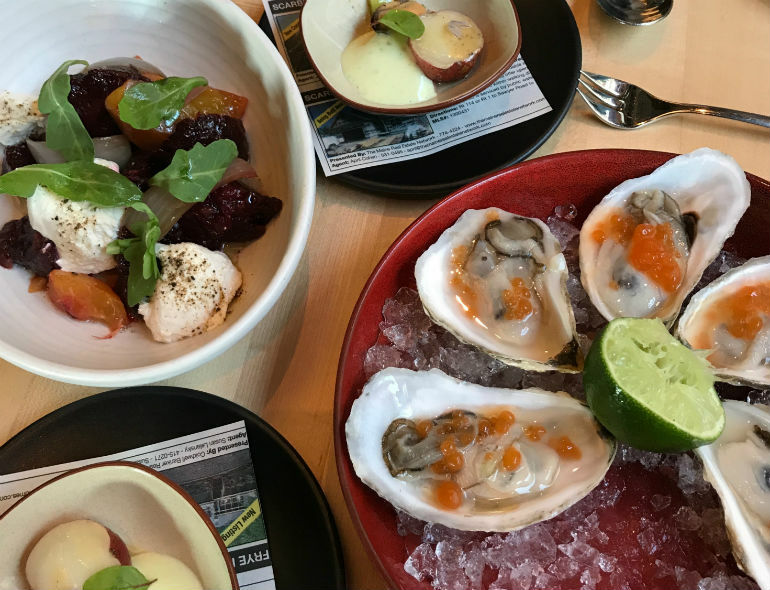 Other recommended AM options include LB Kitchen, a hip/healthy counter service kitchen in the East End and Hot Suppa for Southern-style fare in the West End. We prepared for our leisure strolls with Chemex Bard Coffee and returned for their Nitro cold brew on tap. We perused Bull Moose’s small yet mighty record collection (Ride and Feist’s latest, coveted John Coltrane reissues) and fancy-pants stores Portland Dry Goods and Maine Surfers Union. Depending on our mood (healthy or indulgent), we refueled at Blake Orchard Juicery, The Holy Donut (they use Maine potatoes), and Mount Desert Island Ice Cream (our fave flavor was Bay of Figs). 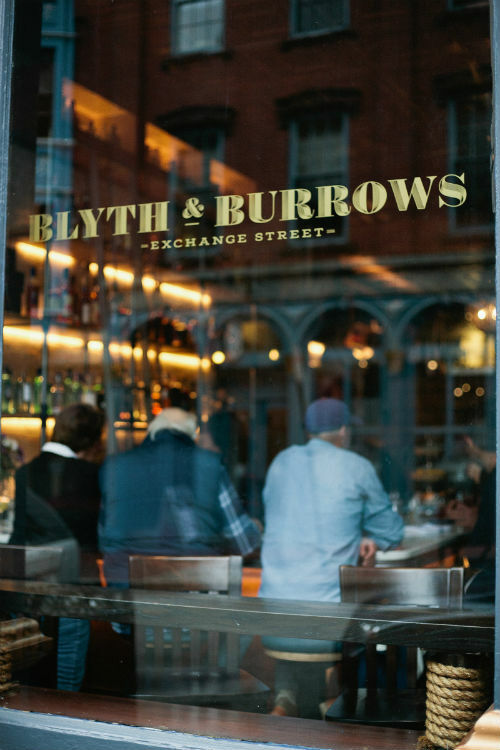 The newest/coolest bar in downtown Blyth & Burrows has amazing small plates (oysters on the half shell or char broiled, tenderloin and chimichurri), a vibrant scene, and creative cocktails like H.M.S. Boxer (fernet, green chartreuse, strega, balsamic basil honey, lime, elderflower) and rosé on tap. We found ourselves wandering the touristy Old Port and decided to take a 15 minute ferry ride to Peaks Island on Casco Bay Lines. Before our departure, we hit up brewery Liquid Riot on the waterfront for a few craft beers. (Portland is chock full of local breweries, so beer tours are a great way to drink your way through a bunch.) You can travel Peaks Island by golf cart or bicycle, and see the entire island in just under an hour. After the idyllic ferry ride, we coasted in coordinated fashion on a tandem bike past crashing waves and idyllic cottages, through the ocean mist. BUT WHAT ABOUT THE LOBSTER? OMG, it’s everywhere! Classic steamed lobster with butter and lemon is thankfully easy to find. But for the best lobster roll truck, we headed to Cape Elizabeth for Bite Into Maine. The famous Portland Head Lighthouse and surrounding scenery weren’t half bad either. Thompson’s Point is a rain-or-shine waterfront venue that plays host to a slew of great acts (coming up: Fleet Foxes, Wilco, Glass Animals, Alabama Shakes, The Head and the Heart). Tennis opened for The Shins as we sampled our way through food trucks and brews. Bissell Brothers Brewing and Stroudwater Distillery are also located on the property. For a more eclectic lineup, we dug the tiny performing arts venue SPACE gallery (Downtown Boys play Aug. 13). Stock up on authentic hipster flannel at the 24/7 L.L. Bean store, about 25 minutes drive from downtown. Hamilton Marine is where fishermen shop, but you can find sturdy rain gear for yourself if you’re willing to invest in a piece. Click here to explore Boston, MA on Culture Collide.